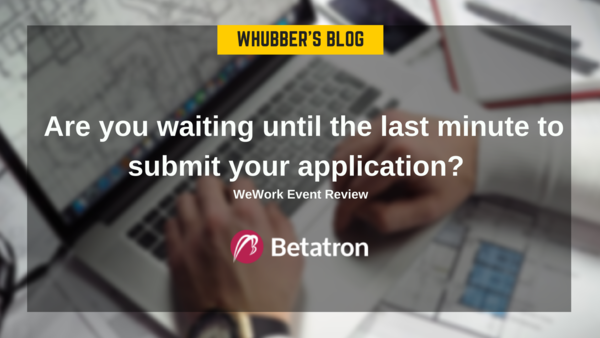 Are you waiting until the last minute to submit your application? When we initially created the event, we were planning to cap the limit at 50 attendees. However, after 90 people signed up and reserved their ticket during the first two days, we knew we to try and extend the capacity, which WeWork kindly agreed to. A special shout-out has to go to Riva Hiranand from WeWork who was faultless in her efforts setting up and hosting the event! It was a great turnout, as we had a fascinating mix of entrepreneurs from a multitude of different industries, such as translation, food, fashion, and skincare, combined with the more common fintech, ecommerce, and mobile app related founders, which you usually meet. 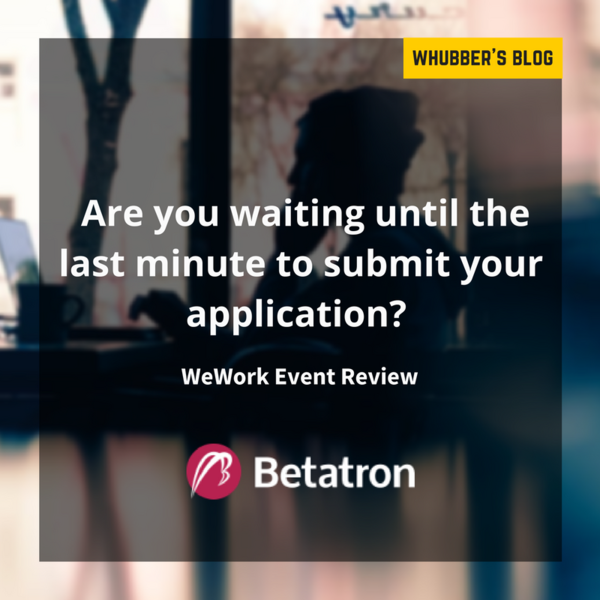 One of the surprising things which I learned, from the founders I spoke with at the event, was the large number of them who told me that they're planning on submitting their applications on the very last day. When I asked them why, the reasons varied, from - "I've been busy and keep getting distracted", "I want to think more about the answers to your application questions", or my favourite one, "I'm only human - and we naturally wait to the very last minute to get things done". This answer got me thinking. As their statement is true. This means, that if you give yourself a month to finish a task, then in your mind, the task will increase in complexity, and therefore become less desirable to finish, so naturally, you'll put it off it's completion. Compared with giving it 4 hours to complete. You'll then build up stress about getting it done, and this will all accumulate until you end up rushing to complete it at the very last minute. I'm sure many of you have experienced this before, especially during your university and school days. Where you'll have a whole term to submit an assignment, but wait until the last few days to actually start it, and then hand it in five minutes before the deadline. So how do you use Parkinson's law, "hack" it, and turn it to your advantage? 1. Set artificial deadlines for every task you need to complete. Write down your list of tasks, note down their deadlines, and then write down how long you think it will take to complete each one. Then HALF each time. And if you stick by this new time limit, sooner or later you'll notice that tasks don't actually take as long as you first thought to complete. Your mind can't function effectively without taking breaks every so often. We all know that. But very few of us actually remember (or have the discipline) to incorporate this knowledge into our daily routines. It's recommended to concentrate and fully focus on a task for 40-55 minutes and then give yourself a 5 minute break. During this break DON'T do anything related to work. Give yourself complete mental rest from your task. Go for a walk. Make a coffee. Read the news. Check Facebook. Play a game on your phone. Use this break as your mini reward and treat yourself. When the five minutes are up, set your timer for 40-55 minutes, and focus on your work again. If you keep doing this routine, you'll notice that when you're in work mode, you'll be less prone to distractions and you'll have more mental clarity to effectively. This is a great hack which everyone should try at least once. Knowing that you only have X hours of battery life left on your laptop and then watching your battery life slowly drain away, will definitely force you into productivity, like nothing else. Using these hacks, you can often get what normally would take you a whole day to complete, finished in only a couple of hours. So for those of you who are waiting until the last minute to submit your application, use this as a wake up call to fix your procrastination habit. You'll find yourself a much more effective entrepreneur in the process! Sam Ameen is the Head of Digital Marketing at IC Studio, one of the founding partners of Betatron. He's passionate about helping companies acquire new customers, using unique growth hacking and user acquisition strategies.